We are the Des Moines area hardscape experts! Today, a paver patio can be an extension of your home that can greatly enlarge your living space, especially during the warmer seasons. A paver patio or hardscape can be used for anything from dining and outdoor entertaining to weddings and birthday parties. 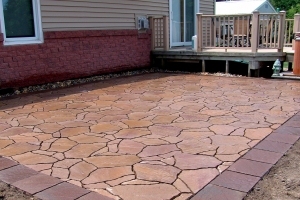 A paver patio not only adds to the functionality of your space, but also adds to your property value. Let us incorporate your ideas to design and build a paver patio or other hardscape that will make your property stand out. Beemer Landscaping wants to help enrich your outdoor living space for years to come with a hardscape design that's well planned and executed from start to finish. Let us help you choose from Belgard pavers, Unilock pavers, or Borgert pavers among others. All installed paver products have a lifetime warranty against breakage for normal usage. What is the purpose for the hardscape? What would be the best location for a paver patio? What hardscape design would fit my needs? What type of pavers should be used for the patio? Do I want a gas or wood fire pit? What is my budget for this hardscape? And many other similar questions. There is no one in the Des Moines area with the hardscape experience we have. If you have an outdoor area or a broken slab of concrete, let Beemer Landscaping design and build a paver patio or other hardscape for you that's beautiful and functional. We service the entire Central Iowa area so contact us for a free quote or fill out our Landscaping Project Questionnaire.